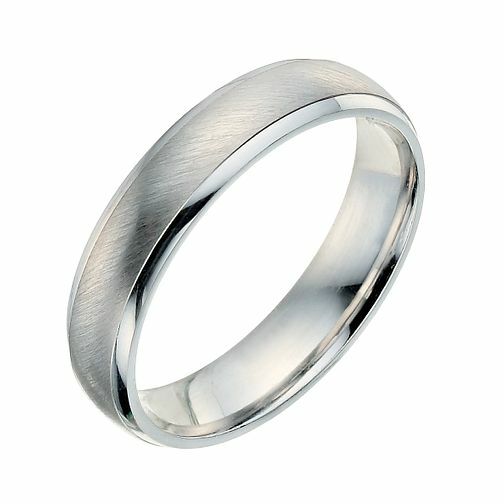 9ct white gold 4mm wedding ring featuring a matt and polished finish. 9ct white gold 4mm matt and polished ring is rated 3.5 out of 5 by 2. Rated 2 out of 5 by Anonymous from Wish i'd known more about white gold before i'd bought it ! Beautiful ring in the shop and looked really nice on my finger but 3 months after we married the matt finish in the middle had rubbed of to leave a yellow colour although the white is still on the rims - so it now looks like a dual colour ring. If i was told the rodium plating does rub of white gold i would never have got it - but i can have the rodium plating re-done before the years out - whats the point if its going to rub off again ! Rated 5 out of 5 by Anonymous from Solid, reassuring! Purchased for my husband to be as his wedding ring. We tried it on in store first, looked at a few other shops but still preferred this one. Ordered online, and it arrived two days later, very prompt!